Ever since Samuel Miller applied for the patent in 1777, the humble table saw has been constant in the world of wood working, a lot of the time taking pride of place in workshops all over the world. It’s easy to understand why when you look at the versatility of the tool. So straight out of the box you’ll be able to rip, crosscut, bevel, miter and with the use of a dado blade, cut rabbets and dado’s. But when you start adding jigs into the mix, the table saw is capable of doing so much more. For a good general purpose cross cut sled, I really like this video tutorial from Marc Spagnuolo otherwise known as TheWoodWhisperer This is a very detailed guide on how to make a very versatile jig. I particularly like the way Marc demonstrates his 5 cut method to check the squareness of the jig and how to adjust for near perfect square cuts. For something a bit smaller Matthias Wandell from woodgears.ca has a great video tutorial on how to make a small cross cut table saw sled. 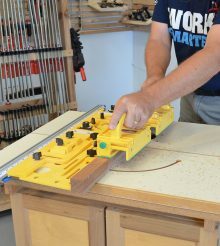 I miter sled is a great jig that allows you to make perfect 45 degree angles consistently. And as Steve Ramsey over at woodworking.formeremortals.net shows us, it doesn’t need to be complicated. You can also make a jig to turn your table saw into a jointer . Now this jig from Jay Bates at www.jayscustomcreations.com is a great multipurpose table saw jig, which lets you joint the timber edges. For more details on this jig, you can find it here. If you have a lot of tenons to cut then, being able to cut quickly and easily on your table saw will save you a lot of time. Now there are a lot of different commercially available tenon jigs available like this one from Rockler. But there are also some brilliant examples of DIY tenon jigs. Here is a video from Steve Shanesy from Popular Woodworking where he demonstrates his incredibly simple but effective tenon jig. Half lap joints are a great way of joining two bits of timber. Now a jig that allows you to cut tenons should also let you cut half laps. 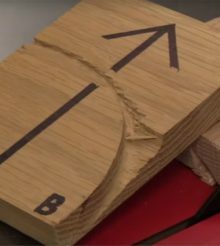 This jig from Woodworkers Guild of America shows you how simple the jig can be to be able to make this cut on a table saw. Some times you need to cut very small parts and it’s just far too dangerous to hold the workpiece so close to the blade. So having a jig that allows you to cut small pieces and at the same time keeping your fingers away from the blade is essential. I really like this jig from Jack Houweling from www.jax-design.net where he has made a very simple and effective small part jig for his table saw. 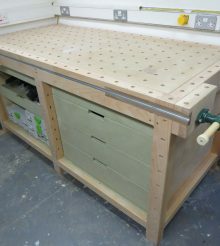 Now one way to create a raised panel cut is to use a router, but with a tall auxiliary fence and an angled blade you can cut raised panels on your table saw. Do you need to be able to mill small logs into useable lumber? Well with this jig you can. Izzy Swan from https://www.izzyswan.com/ comes up with some brilliant table saw jigs and by his own admission is table saw jig mad. This is just one of his many great jigs. If you need to cut dowels, then this clever little jig from Jim Steinbrecher shows you a very clever way of shaping dowels on a table saw. Here is another jig from Jack Houweling Demonstrating the jig he has made that not only cuts circles on the table saw, but it also has a feature that will let you cut gear teeth into the circle. Here is another great jig from Marc Spagnaluolo at TheWoodWhisperer which demonstrates a very simple but effective way to cut coving curves on a table saw. If you need a specific curve profile there is a very handy calculator over at fine woodworking which tells you at what angle you need the jig and what angle you need the blade to get the profile that you need. Now the video from David Picciuto above is great if you are cutting splines on picture frames, but it just wouldn’t give you the support you need if you were cutting splines on boxes. This great jig from Jay Bates from jayscustomcreations is perfect for the job. Sometimes you will need to be able to cut an angle greater than the 45 degrees that you can cut on your table saw. And with a simple jig it’s possible on the table saw. Now if you ever find yourself needing to make some wooden pulleys then this video from woodentoolman shows you how to. Izzy Swan from www.izzyswan.com/ has done it again with brilliant jig that turns his table saw into a lathe. Yet another one from Izzy Swan, this jig allows him to turn a square piece of timber into a cylinder and then cut flutes into it. This is a very cool jig from popular woodworking, Mario Rodriguez demonstrates how to quickly carve the seat for a contemporary chair. So when it comes to making a bowl, most people would turn to the lathe, but Izzy Swan from www.izzyswan.com has come up with this amazing jig that lets you carve round bowls with a table saw. Yep, you did read that right. And its thanks to Izzy Swan again. Who really is pushing the boundaries again as to what you can do with a table saw. You have to see it to believe it. So I think that covers a lot of what is possible with a table saw. I’m sure to have missed something so if you know of a something that can be achieved with a table saw thats not covered here, please add a comment here or find me on Twitter or Facebook and I’ll get it added to the list.